Standing, making or Mexican Waves? 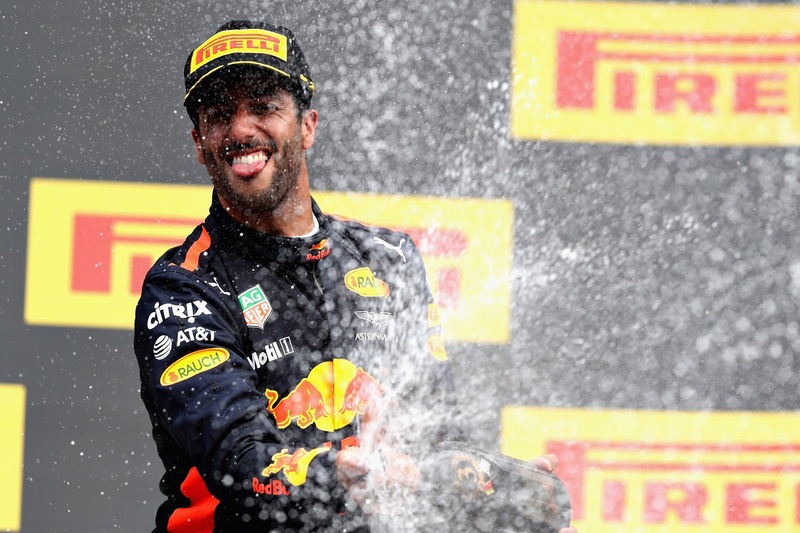 Daniel Ricciardo has a knack for being in the right place at the right time and managed to pick up another podium as his Dutch teammates luck went from bad to worse. The plucky Aussie had tested a lower downforce rear wing for the team in Free Practice, as they both evaluated what they'd be running for Monza and checking if they could get away with it at Spa. It was easy to see from the sector times that was being gained on the straights was being lost, with a handful more in the twistier second sector - even though the RB13's chassis is clearly more on song at this stage in the year. The Aussie may have retired his now infamous shoey celebration but that didn't stop the cheeky scamp from whipping the crowd into a frenzy, as his fellow countryman, Mark Webber, conducted the podium interviews with Lewis and Seb he got a Mexican wave underway. Meanwhile, a forlorn Max Verstappen wants to put this season behind him already, having retired from half of the races so far this season - four of which have been mechanical failures and the other two in first lap crashes. 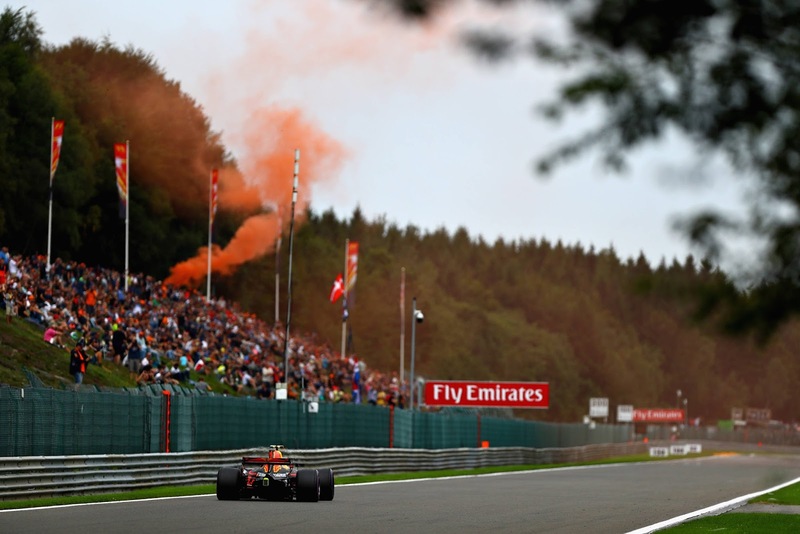 The Dutchman is also responsible for a resurgence in tickets sales for the Belgian GP, with swathes of orange shirts, caps and even flares seen around the circuit, all of which belong to fans unamused by his early retirement from a promising position. Max was clearly dissapointed and in an interview with NBC had the following to say..
“Of course, in the beginning, you say maybe it’s just bad luck or whatever, I’m actually competing against Fernando in terms of retirements. It’s unbelievable, I’m not happy at all. Standing waves have been an issue for Pirelli in the past in Belgium but frankly nothing like the ones we saw during the race weekend this year. The GIF in Ky's tweet above goes to show exactly what I'm talking about, with the entire tyre dancing around like a hooligan. It's a resonance phenomenon caused by a number of contributing factors, such as tyre pressures, suspension geometry, slip angle, traction factors, torque supplied by the power unit etc, etc. Nonetheless it's a worrisome sight and one that Pirelli were keen to investigate and found no harmful side effects. BOOM, back to Saturday and Lewis pops his W08 on pole with a time of 1:42.553 which when compared with Rosberg's pole of 2016 - 1:46.744 puts the sport within the 3-4 second lap time gain it gave itself for 2017. The Brit also drew level with Michael Schumacher's pole position record of 68 pole positions, a feat that was promptly acknowledged in the broadcast, with Ross Brawn even bought in to pass on the thoughts of the Schumacher family. Talking of which, Mick Schumacher was in Spa driving the championship winning B194 Benetton as a mark of respect for his Dad's achievements, having taken his first victory at Spa 25 years earlier in 1992. 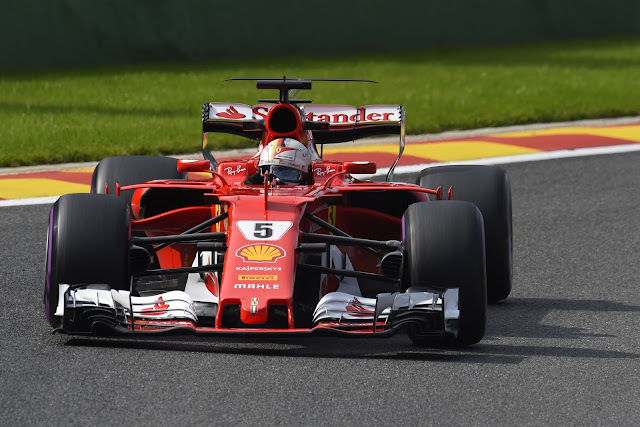 Shifting focus back to Lewis and his championship battle with Sebastian Vettel, the race was a tense affair, as has been the case on numerous occasions throughout 2017 and saw the pair trading lap times back and forth, even if not positions. At this stage I think it's worth drawing attention to the sacrificial part that Kimi Raikonnen played in Seb's grid position too, with the Finn having blown his qualifying lap he placed himself in front of the German in order that he pick up a tow, improving his lap time and leap frogging the Mercedes of Valterri Bottas. Perhaps that's as good a time as any to intersect with a mention of Alonso's qualifying performance, which perhaps set the tone for his race retirement. 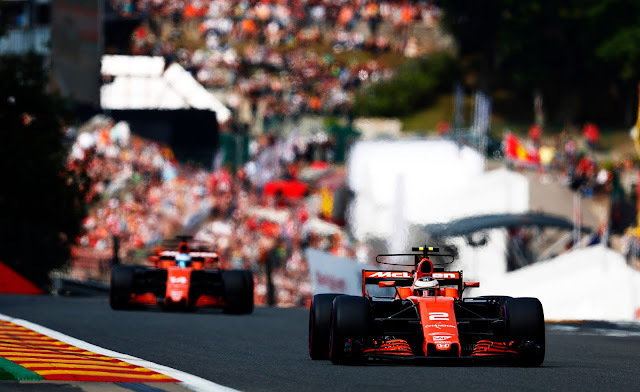 Already condemned to a 65-place grid penalty, in front of his home crowd no less, Stoffel set about helping his Spanish team mate to a tow along the Kemmel Straight during Q2. It worked to fantastic effect only to see the advantage destroyed by an algorithm that controls energy deployment throughout the lap. Thinking the Spaniard was at a different place in the lap it didn't give Fernando full energy deployment, much to his dismay, as he shouted "NO POWER, NO POWER" over the radio, having essentially lost 160bhp from the MGU-K. Switching back to the race, which centered around the tense battle between the two title protagonists, lap by lap it became clear that any opportunities to pass were going to be sparse and likely driven by outside factors, mistakes or strategic calls. The action was actually a combination of all of these, as decisions made when Perez and Ocon collided proved pivotal. The Force India pair clearly need to take a long hard look at themselves and must be glad they're not embroiled in the championship battle they found themselves in with Williams last season, as financially they need to secure fourth place again if they're to succeed illy continue their ascent through the ranks in the coming years. What started as a spat between two team mates has turned into a battle of drivers at polar opposite ends of their career, although both are vying for the attention of onlookers, rather than anyone at their current employer. The collision that bought out the safety car was a few laps in the making, with Perez having jumped Ocon during the pit stops, as the Mexican stole the undercut, having pitted first to serve his 5 second penalty. Obviously aggrieved the Frenchman made his feelings felt over the radio but set about dealing with it himself out on track. The sensible choice having caught Sergio would be for Esteban to follow him up over Radillion and pass him with DRS down the Kemmel straight, especially as the pair have previous - not only in the same race but several others this year. However, let's put it down to youthful exuberance and perhaps some expectant inter-team respect, as Ocon placed his car in a less than desirable position and had nowhere to go, Sergio began closing the door - or should we say slammed it?.. In any case, the Mexican clearly has to shoulder the largest proportion of the blame but may have a wry smile as the pair will no longer be able to go wheel-to-wheel, as the team have closed that chapter - suggesting that team orders will be in play for the remainder of the season. The ensuing safety car saw both Lewis and Sebastian take to the pit lane, as would be expected, as essentially it becomes a free stop. The Mercedes garage must have breathed a huge sigh of relief at this stage, as they'd already been monitoring the Brit’s right rear tyre, as a blister was causing concern and was going to prompt another stop at some point anyway. Exiting the pits it was clear that different approaches had been taken by Mercedes and Ferrari with #5 clad in brand spanking new ultra soft tyres, whilst #44 who didn't save a set in qualifying was forced to run another set of the soft tyres. 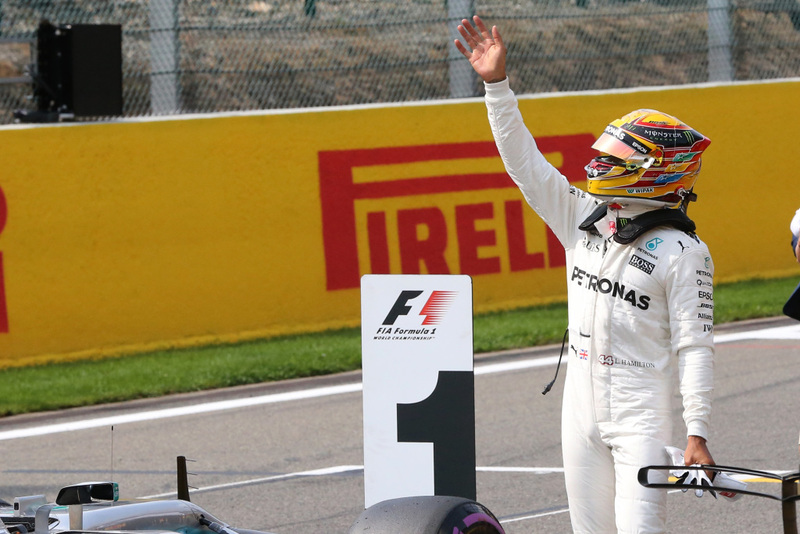 Lewis made numerous references to the length of the safety car stint and its speed over the radio as he was clearly struggling to maintain tyre and brake temperatures, something he knew his German counterpart would be faring better with on the ultra’s. The restart would prove to be pivotal then but the one thing that I kept thinking is, am I the only one who realizes that these two contrasting tyre compounds operate better at different temperatures? The soft tyre is in the high working range - 110-140 degrees centigrade, whilst the ultra works best between 85-115 degrees centigrade. This is an important factor and made the first few laps after the safety car the only real point at which Vettel could make it count. As beyond that, the higher working range tyre is bound to make life easier, especially as the trailing car inevitably slides around in the wake of the lead car. 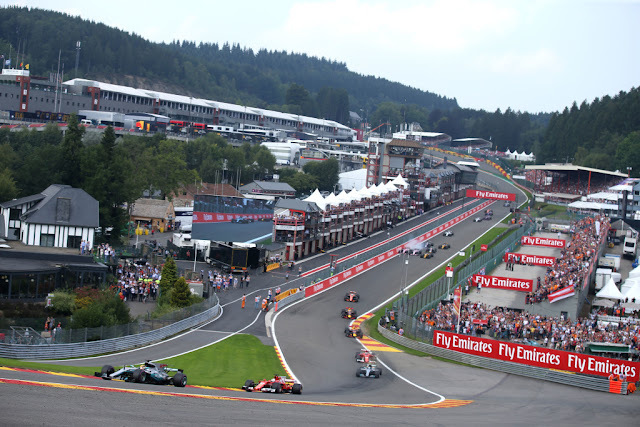 Hamilton was both fortuitous and canny at the restart, having selected the wrong mode and only using 90% throttle on the way up the hill he put Seb in a position where he had to back out, putting him on the back foot as they took off down the Kemmel straight. Nailed nose to tail as Seb pulled out from behind the Mercedes he didn't have the momentum or DRS to help him overcome the ensuing drag and lost out to Lewis. The remaining laps were a simple game of cat and mouse, with any mistake from Lewis likely leading to another battle along the Kemmel straight, alas as a neutral it wasn't to be the case. The Belgian GP was not a classic by any stretch, but as most of the 2017 has proven we don't need a bunch of meaningless DRS passes to provide entertainment. This year F1 is different, it's tense and unwavering, a glimpse of what the sport should be, as two of the best go head-to-head.